World of Warcraft's next patch might let you pay your way to the level cap. While the subscription model was once law in the land of MMOs, World of Warcraft is now one of the few games in the genre that hasn't switched over to a free-to-play or microtransaction-driven business model. That could be changing in the next update, judging by an item discovered in a public test version of the game. One sharp-eyed user spotted a potion that is listed as being purchasable from a yet-to-be-implemented in-game store. The potion in question doubles the amount of experience points earned from killing monsters and completing quests, which would be an easy way for Blizzard to reap some income from impatient players if this truly is the start of a microtransaction item trade. The item was discovered through datamining from the latest Public Test Realm build, and is identified as part of the "5.4 In-Game Store." 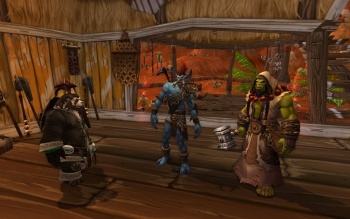 It's pretty vague terminology, but it does point to a major change in WoW's economy. This could be the beginning of a larger system of convenience items for players with more cash than gold, or it could open the door for a new player economy similar to Diablo III's real-money auction house. Blizzard has sold pets and special mounts for real money in the past, so nothing's out of the question. Of course, this is mined data that hasn't been confirmed by Blizzard, so it could easily be a red herring or temporary placeholder. Capitalists of Azeroth, keep an eye out. Update: According to Zarhym, a community manager on the WoW forums, this is certainly something on Blizzard's to-do list. "We are currently exploring the possibility of adding a way for players in certain regions to make purchases directly within the game," Zarhym says. "We'll provide additional updates on our plans as development progresses."